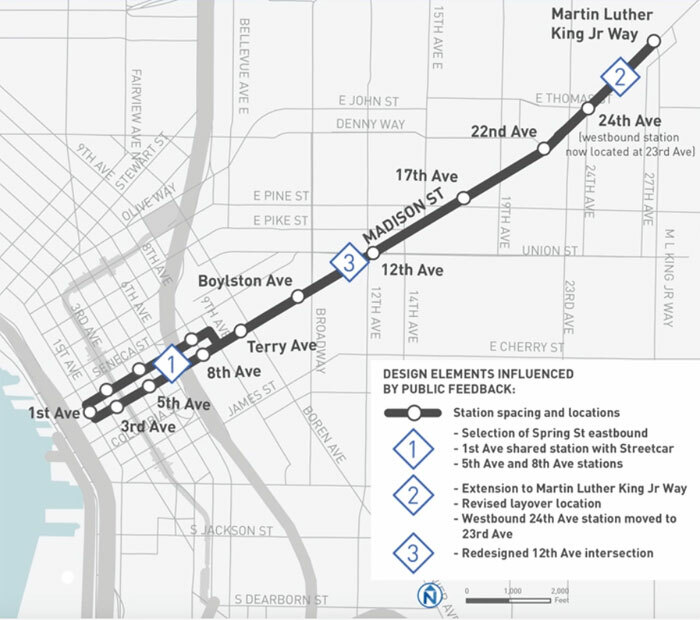 SDOT is still banking on federal funding for its Madison Bus Rapid Transit corridor project, but expects completion to be pushed back to at least 2021. The city has been planning a dedicated bus line from First Avenue to Martin Luther King Jr. Way in Madison Valley for years, and construction along the corridor to add transit-only lanes and platforms is expected to start sometime in 2019. SDOT has $15 million secured through the Move Seattle levy, plus $28.5 million likely to be provided through a partnership with Sound Transit. King County Metro has agreed to provide $4.4 million for the Rapid Ride G fleet. Between First and Eighth avenues, and again between 15th and 17th avenues, the buses on the line would use shared business access/transit lanes. Between Sixth and 15th avenues, the route would split off into transit-only lanes. From 17th Avenue to Martin Luther King Jr. Way, the buses would merge into general-purpose lanes. The Madison BRT project will also require the repair or replacement of 17,000 square yards of sidewalk, and putting in just 0.67 miles of bicycle lanes, which includes 0.23 miles of existing lanes on Spring Street that will need to be replaced after new pavement is installed. Madison is one of seven multimodal corridors slated for major infrastructure improvements in the nine-year, $930 million Move Seattle levy, which was approved by voters in November 2015. With the Madison BRT design expected to be completed this year, it is one of four corridors the Levy Oversight Committee has recommended take priority for development, with Delridge, Roosevelt/Eastlake and Rainier being the others. The Seattle City Council’s Sustainability and Transportation Committee received an update on the progress of the Move Seattle levy on Aug. 7. SDOT civil engineer Lorelei Williams said Madison and Roosevelt projects are both up for potential FTA funding, but it does remain uncertain when the feds will make a decision. Both projects were rated high for the Small Starts program. Williams said SDOT is looking at designs for the projects that would rely only on levy funding, and that could align with other levy subprograms — sidewalks, paving, bikes — in order to maximize multimodal benefits. Councilmember and committee chair Mike O’Brien said spot improvements could provide positive changes in the seven multimodal corridors, but there remains the question of how long the city should wait on federal funding before moving on to other opportunities. If the federal funding does not materialize, O’Brien said, he does not see how the city could move forward with its large-scale visions for these corridors. The project will require 1.2 miles of overhead contact system (OCS) wires — 174 new and 86 replacement OCS poles — a traction-powered system substation, 10 BRT station areas with 20 directional platforms (there will be a shared station on First Avenue) and transit signal priority and adaptive traffic signal control upgrades at 23 intersections along the line.